Anyone familiar with Samuel Taylor Coleridge’s famous poem, Rhyme of the Ancient Mariner, knows that the albatross is regarded by superstitious sailors as a good omen as long as nobody on the ship shoots one out of the sky. 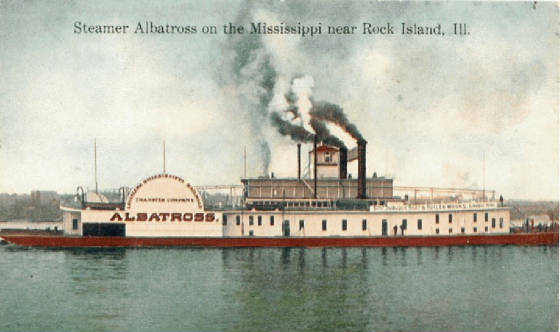 It should be no surprise then that the railroad car ferry Albatross, built in Dubuque, Iowa in 1907 for the Louisiana & Mississippi Valley Transfer Co., not only enjoyed years of good service on the Mississippi River, she may still be afloat today and until quite recently served as a popular floating gambling casino moored at St. Louis, Missouri. The history of this particular vessel is unusually varied. It began service as a small ferry with a capacity for carrying 16 railroad cars on a single trip, was expanded to become one of the largest ferries on the river and an engineering marvel in its day, then was completely rebuilt to be an Art-deco-styled passenger ship and renamed the Admiral, and finally in 1979 it was put in use as a moored casino and renamed the President Casino. Supporting all of the glamour above the water is the original steel hull produced in Dubuque and then expanded in 1921 to a length of 365 feet. With the two paddle wheels on her sides, the vessel measured an incredible width of 53.8 feet. That expanded hull was the first phase of a complete rebuilding of the vessel at St. Louis. In 1937 the ship was purchased by Streckfus Steamers, Inc., and then rebuilt into a five-deck passenger vessel. It took two years to complete, and when finished, the Admiral was considered the largest passenger liner in existence on U.S. inland waterways. Unique to this vessel was the fact that two of the decks offered air-conditioning, an unheard-of luxury in that day, and three open decks. The steel hull was divided into 74 compartments. It was said that as many as 11 compartments could be flooded and the vessel would remain afloat. The vessel had a capacity to carry up to 4, 400 passengers. Between 1940 until 1979 the Admiral was a familiar sight on the river, making regular passenger excursions from St. Louis. The boat was originally a side wheeler but in the winter of 1973-74 it was converted to diesel power with propellers. In 1979 the Admiral went through its final conversion into a floating entertainment night club. The engines were removed and the vessel was permanently moored. The finances were shaky, however, so in the 1990s, as gambling laws became more relaxed, the vessel became a riverboat casino. It operated 1,230 slot machines, 59 gambling tables, offered 18 bathrooms and a restaurant. The owners made attempts to sell the ship and there is concern that the career of this century-old landmark has at last come to an end. It was removed from the St. Louis riverfront in 2011 and possibly taken to a scrapyard.